Today we have a new guest reviewer Jason Chirevas! He's here with a great review of two somewhat controversial figures, Going Turbo Max Steel and the new villain, Vitriol. Because of the attacks of September 11th, and the connection to terrorism that these two figures have, they've been in the news. Jason talks about this briefly at the bottom of the page - let's get on to the review! Thank you very much, Michael. Hello everyone, my name is Jason Chirevas and tonight I'll be reviewing the two latest offerings from Mattel's highly successful Max Steel line of 12" scale action figures, vehicles and accessories. They are "Going Turbo" Max Steel and Vitriol, the latest villain in the line. A new villain is always cause for celebration but this particular version of our hero was also highly anticipated as it features Max in his N-Tek uniform from the CGI animated series that bears his name. A very brief synopsis for the uninitiated. 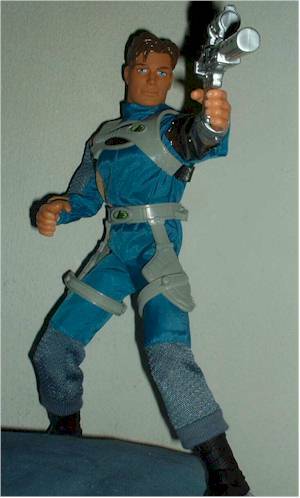 Max Steel represents Mattel's foray into the world of 12" action figures and was the best-selling 12" action figure line of the year 2000. Teen extreme sports star Josh McGrath takes the secret identity of N-Tek agent Max Steel after the proverbial freak accident infuses his body with nano-probes capable of giving him super strength, agility etc. Max is literally and figuratively the son of Big Jim McGrath, who was Mattel's answer to G.I. Joe throughout the 70's and (internationally) into the 80's. Big Jim was also a sports star-turned-secret agent and battled evil as commander of the P.A.C.K. (that's Professional Agents and Crime Killers to you and me). Max Steel packages are always bright, colorful and attractive. They all feature renderings of the character or vehicle (ala Masters of the Universe) and in this case the image of Vitriol is particularly well done. The card back features a big picture of the figure in an action pose and a run-down of his weapons and equipment. A smaller window shows all the figures and vehicles in the wave, which in this case is part of the Urban Siege theme of the line. More on the mission theme later. Vitriol surprised me a bit here. Max let me down. Vitriol has 12 points of articulation (ball-jointed shoulders, wrists, waist and hips. Regular joints at the neck, knees and ankles). Vitriol lacks elbow articulation as his action feature prohibits it. Also, as I stated above, I was glad to see Mattel gave him standard Max legs instead of the original Psycho's (for the record, Bio-Constrictor is the best-articulated of the villains). Max sports 14 points of articulation, but overall is a let down. For the money I paid, I expected to at least get the double-jointed knees of the "Ultra Action" Max's of the line, but instead we get the usual "Super" articulation (ball-jointed neck, shoulders, wrists, waist and hips. Regular joints at the knees, ankles and left elbow, ball joint at the right elbow). Max's body is pretty standard issue; the bulk of his aesthetic appeal will be covered in the next section. Max's head sculpt is, as always, excellent. 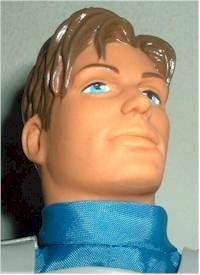 His features are sharply defined and I've always been a fan of the hair sculpts in the entire Max Steel line. Vitriol, on the other hand, is a new sculpt for the most part. The head sculpt is very on-model to the CGI series (with more good hair:)) and his armored torso features some nice detailing. Vitriol's arms are cast in a translucent green plastic with lighter green piping visible on the inside of each. Also, Vitriol gets better treatment that the original version of the line's main baddy, Psycho. That figure featured almost Ken-like legs but Vitriol's are the same sculpt as Max's (both are a better grade of plastic than some of the line's earlier figures, by the way). The paint-ops on both figures, though limited, are clean, clear and the paint used is of excellent quality. Both figures' hair and facial features are painted with precision. As for the clothing, we'll tackle Vitriol first. His only piece of cloth attire is his pants, which are of a dull, nylon type material (better than it sounds). Strangely, there are three villains in the Max Steel line so far and they all wear the SAME PANTS, albeit in different colors and materials. Also, Psycho and Vitriol wear the same short, black boots (the third villain, Bio-Constrictor, is barefoot). Obviously, some variation in the villain leg-wear would have been appreciated. As for Max's attire, it's the main reason to buy the figure. Max's N-Tek uniform from the TV show is beautifully rendered here; incorporating different materials in the arms and legs to go along with the main body, with is a shiny nylon. The front panel of the left arm is made of a light translucent plastic, which is a dark orange in color. We'll get to why that is in the next section. Max is also wearing a chest harness and a waist-mounted weapons harness (both bear the N-Tek logo). Both harnesses are of a tough, flexible rubber and fasten to the figure extremely well. Max's boots are higher than Vitriol's and are of a totally different style, which I really appreciate. In a potential nod to the P.A.C.K. Commander version of his dad Big Jim, Max's suit sports a turtleneck, the pant legs are of a boot-cut length and his chest harness resembles the shoulder holster Big Jim wore in his crime killing days. If this was unintentional on Mattel's part, so be it. But the similarities ARE there and that just makes Max's uniform as cool as cool gets. Not much to report here as far as accessories go. Vitriol is essentially a living weapon, so he doesn't come with any accessories. Max comes with the latest in a long line of N-Tek laser pistols, each different from the next. This particular gun is a bit large to be considered a pistol and features a scope. The pistol included with the Wal-Mart exclusive "Secret Agent" Max Steel would have been more appropriate here as it's smaller and a more compact design, but the gun used here IS a new sculpt, so that has to count for something. Both Max and Vitriol feature a light-and-sound gimmick. Push a button on Vitriol's armor and his arms flash and make a cool blasting sound (representing the villain's ability to project waves of destructive energy from his arms). When a small button on Max's Bio-Link communicator (on his left wrist) is pressed, he says "Going Turbo!" and his left arm flashes rapidly with an accompanying "power up" sound. Both gimmicks are pretty cool, VERY character (and TV show) specific and add to the overall mystiques of the figures. Your devotion to the line is the deciding factor here. These figures were $19.99 at Target (which seems to be the only retail chain receiving them) and to me they were worth it. Villains in the line are few and far between and here you get a cool character with a nice light-and-sound feature. As for Max, if you're not a devotee of the animated series, I'd say pick up one of the "Ultra Action" versions of him for the same price as it will be markedly better in terms of articulation. I LOVE the Max Steel show and HAD to have this version of our hero, so I didn't mind paying twenty bucks. 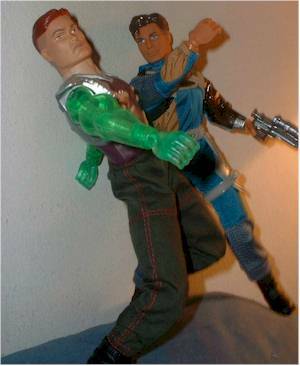 A casual Max Steel fan might regret it. I am one of the few rabid 26-year old Max Steel fans out there...I know this. This line has tremendous kid appeal (as it's profit for last year indicate) and collector interest has been very low from the start. I, on the other hand, love the kind of old-fashioned "boys' adventure" themes that Max Steel represents and it is one of my favorite toy lines of all time. It's a line steeped in Mattel history and tremendous playability and these two new figures are vital to the mythos created by the animated series. If you're already one of the few adult Max Steel fans out there, go GET these guys. If not, consider them (or any other Max Steel figure) anyway; there is a charm to this classically themed line that is undeniable. Global Assignment: Vitriol is on top of the World Trade Center ready to blast the city with his deadly energy waves! Your Mission: Stop Vitriol before he destroys New York City! The card then goes on to list the Max Steel figures and gear needed to play out this adventure. I'd have to say I now agree with Mattel's decision. The Max Steel Heli-Jet vehicle has also been pulled from all Toys R Us stores, presumably because it's mission card contains the same text. Mattel has further decided that this wave will be the last Urban Siege mission theme it will do. Folks, thank for taking the time to read this review and thank to Mr. Crawford for allowing me to bring it to you. My name is Jason Chirevas...Good Night.